Greg Lloyd makes good on his promise to knock Dan Marino "into next week" in a game where little else goes right for the injury-ravaged Steelers. With O'Donnell sidelined due to a broken finger, Mike Tomczak gets the start and tosses a pair of costly first half INTs that Miami easily cashes in for 10 points. A John L. Williams fumble at the Pittsburgh 21 with a minute left in the first half gives Marino a short field against Pittsburgh's injury depleted secondary, and Dan takes full advantage with a 28-yd TD to Terry Kirby for a 17-3 halftime lead. All told, 3 of Pittsburgh's 5 turnovers lead to Miami scores and 2 end scoring threats. A special thanks to J.J. Cooper for generously providing us with this game! The famous Bill Cowher "stick this in your pocket" moment with an official at halftime. A special thanks to Gary Beach for contributing this missing game video recorded from Sky Sports (UK), broadcast on the Monday after the game was played (UK time). The game is shortened to just under 2 hours. Revenge!!! Well, sort-of. Pittsburgh simply takes it to the Bolts in a rematch of the '94 AFC Championship game. The Steelers are clearly on a mission in this one, marching 75 yards in 11 plays on their opening drive, capped by a 1-yard scoring run by Bam Morris. Pittsburgh's defense then steps up with two interceptions for TDs and the rout is on. Willie Williams picks off a Humphries pass and returns it 63 yards for a touchdown with 6:10 left in the 1st quarter. Alvoid Mays then returns an INT 32 yards for another score with 1:33 left in the quarter to increase Pittsburgh's lead to 21-0. Williams and Mays finish with two interceptions EACH for the Steelers, who pick off Humphries a total of four times. Bam Morris adds a second rushing TD before the half Pittsburgh builds a 31-6 halftime lead. It's hard not to look at this game, think of the '94 AFCC and say, "What if?" In an effort to save the season after shockingly losing 4 of their last 5 games, Cowher makes wholesale changes on both sides of the ball, inserting new starters at 9 of 22 positions. It pays off as the Steelers dominate the expansion Jaguars (who had shocked Pittsburgh 20-16 just two games earlier). O'Donnell throws 2 TDs, Thigpen grabs 5 for 87 yds and a TD, Pegram rushes for 84 yds and a TD, and the "Slash" experiment begins for real with Kordell Stewart. Meanwhile, Carnell Lake's move from safety to CB in Pittsburgh's reconfigured defense proves successful as the Steelers completely shut down Jacksonville, sacking Brunell 7 times and not allowing the Jags to cross midfield until the 3rd quarter. 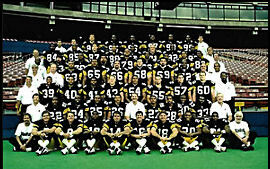 The first win of Bill Cowher's new "9 game season." Slash! Rookie Kordell Stewart throws his first career TD pass and Erric Pegram rushes for 112 yards as the Steelers whip the lethargic Bill Belichick-coached Cleveland Browns and take control of the AFC Central. Johnson kicks two FGs and O'Donnell adds a 4th-quarter TD pass as the Steelers win their 3rd straight. Stewart, in a formation foretelling things to come, lines up behind center with the game scoreless in the 2nd quarter and Pittsburgh at the Cleveland 2. Stewart rolls right and is cut off. With no receivers open, he sprints back left and looks as if he is going to run, but he pulls up at the last moment and lofts a pass to Mills drifting across the back of the end zone. Stewart, who catches 2 passes for 21 yards, also picks up a key 1st down in the 4th quarter when he runs 11 yards on an option. Five plays later, O'Donnell hits Thigpen with a 9-yard scoring toss. The Browns manage just 120 yards, only 10 of which came in the 2nd half (with ZERO first downs)! Cleveland goes 1-of-10 on 3rd-down conversions and is sacked 4 times. One of the greatest comebacks in franchise history! This is definitely one of my favorite "90s-era" games. The Bungles had already embarrassed the Steelers 27-9 a few weeks earlier before a stunned Three Rivers crowd, dropping Pittsburgh to 3-4 and threatening to end the team's playoff hopes just midway through the season. This time, the Bengals jump out to a 21-3 advantage just one series into the 2nd quarter, and still hold a 31-13 lead early in the 3rd after they march down the field for a TD on their opening drive of the 2nd half. Already counting his chickens, Dave Shula is absolutely tickled pink on the sideline, so much so that he actually taunts Pittsburgh players. His euphoria evaporates rather quickly over the next quarter and a half, however, as he watches his coaching career go down the tubes (you can almost hear the giant flushing sound at Riverfront Stadium), the victim of 36 unanswered points by Pittsburgh. O'Donnell throws for a career-high 377 yards and 3 TDs and Morris rushes for 101 yards and three scores. Pittsburgh scores 5 straight TDs while the defense allows Cinci only one 1st down on its final four possessions. There are many memorable moments in this pivotal game, but the image that will stay with me till the day I die is that of Kordell "Slash" Stewart's electrifying 71-yard TD grab. On 3rd and long, O'Donnell finds a wide-open Stewart over the middle about 20 yards downfield. Slash somehow knifes between two DBs, then turns on the afterburners, completing the play with a 360 degree pirouette as he slips out of the grasp of a defender en route to the end zone. Stewart's play gives the Steelers their first lead of the game, solidifies Kordell's superstar status as "Slash" and ostensibly ends David Shula's coaching career. Gotta love it! The final game (until Cleveland's return) in one of the most bitter rivalries in NFL history. Cornerback Willie Williams gets a pair of turnovers on Cleveland's first two offensive plays that lead to Steeler TDs and Johnson's 27-yard field goal 7 seconds into the fourth quarter breaks a tie to lift the Steelers to a 20-17 victory over the Browns. The Steelers (8-4) inch closer to their 4th consecutive playoff berth and 2nd straight division title, building a 3-game lead in the AFC Central. The Steelers win their sixth straight and clinch their 3rd AFC Central title in 4 years. O'Donnell hits Thigpen on a 33-yard crossing pattern in which Thigpen gathers in the pass, deftly avoids two tacklers at the 15-yard line and cruises into the end zone to open the scoring on the final play of the first quarter. After Houston ties the score on a fluke 76-yard TD pass from Chandler to Sanders, O'Donnell puts the Steelers back in front when he connects with rookie TE Bruener from 7 yards out just before halftime. Bruener's score caps a 6-play, 59-yard drive that consumes just 81 seconds. Bam Morris finishes the scoring with a devastating 30-yard BLAST up the middle late in the 4th quarter that puts him over 100 yards and puts the Oilers away. 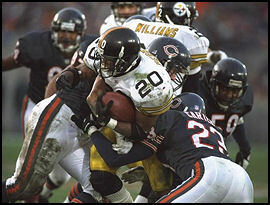 In spite of a rocky start, this is the game when I knew for sure the Steelers had what it took to get to the Super Bowl. Joined in progress with 2:28 remaining in 1st quarter and the Steelers leading 7-0 courtesy of an O'Donnell to Mills pass. O'Donnell struggles early, throwing a horrible pass at the goal line that is tipped and intercepted for an easy 1-yd Raider score. A few plays later, O'Donnell throws a "Garo Yepremian-esque" interception at midfield for another apparent TD. Fortunately for the Steelers, a blind ref rules O'Donnell in the grasp, the TD is overturned and the Steelers retain possession. Neil eventually composes himself and from that point on, the Steelers OWN the Raiders. A great Greg Lloyd INT at midfield with 0:30 left in the half sets up a TD pass to Mills (keyed by a long reception by Kordell) giving the Steelers a commanding 20-7 lead at halftime. Erric Pegram plays a great game with 122 yds on 26 carries. Footage includes some nice postgame analysis and a feature on the death of Ray Seals' cousin at the hands of Pittsburgh police. Christmas comes early for the Green Bay Packers as Yancey Thigpen drops the sure game-winning TD on 4th and goal with 11 seconds left in the game. While the drop doesn't mean much to the Steelers who have already solidified a first-round bye in the playoffs, it gives Green Bay their first division crown since 1972. A special thanks to Matthew Simon for generously providing this game! A balanced Steelers offense produces 409 yards, including 262 yards passing by Neil O�Donnell and 106 yards rushing by Bam Morris, as the Steelers hold off a late Buffalo rally to advance to their second consecutive AFC Championship game. Pittsburgh jumps out to a commanding 20-0 first half lead and seems to have the game well in hand after Carnell Lake picks off Jim Kelly to give Pittsburgh a 26-7 advantage late in the 3rd. But the always resilient Bills come storming back, narrowing the score to 26-21 on a short Thurman Thomas TD catch with 11 minutes remaining. But Bam Morris ends the Buffalo threat with a pair of bruising 4th quarter scoring runs in a span of 3 minutes, including a 13-yd TD in which he simply blows up Buffalo safety Matt Darby on his way to the end zone, paving the way to the Steelers second straight home AFC Championship game. Video includes lots of pre and postgame footage as well as NFL Prime Time highlights. One of the most exciting AFC Championship games of all time! A 37-yard bomb from O'Donnell to Ernie Mills (who makes a fantastic sideline catch) sets up Bam Morris' winning 1-yard TD plunge just as it looks as though the game has slipped away from the Steelers. Gritty Jim Harbaugh moves within striking distance in the waning moments only to watch helplessly as his "Hail Mary" bounces in and out of the lap of Colt receiver Aaron Beasley in the end zone on the game's final play. Also includes Greg Lloyd's infamous "F-ing Super Bowl" postgame quote on national TV (score: Greg Lloyd, 1 -- TV censor button guy, 0). O'Donnell throws it away, earning MVP honors for Larry "I was just standing there and the ball came right to me" Brown. This is a Super Bowl that will be remembered more for O'Donnell's devastating, head-scratching picks than for any spectacular plays by the Cowboys. 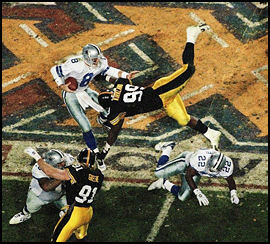 The Steelers are jittery early, and when Dallas jumps out to a 13-0 lead midway through the 2nd quarter after a Jay Novacek TD reception (on an illegal pick play, just sayin'), it looks like another Super Bowl blowout is in the making. 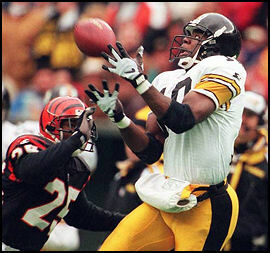 But the Steelers keep fightingfight back and grab the momentum in the final seconds of the first half when O�Donnell connects with Yancey Thigpen on a quick TD slant in front of Deion Sanders. Disaster (INT #1) strikes in the 3rd quarter when Cowboy CB Larry Brown intercepts a HORRIBLE O�Donnell pass to no one and returns it 44 yards, setting up a 1-yard Emmitt Smith plunge that ups the Dallas lead to 20-7. Once again, the Steelers battle back and early in the 4th quarter, Norm Johnson boots a field goal to narrow the score to 20-10. On one of the gutsiest coaching calls in Super Bowl history, the Steelers perfectly execute a surprise onside kick (recovered in stride by Deion Figures) which ultimately leads to a Bam Morris TD to bring the Steelers to within 3 points of the shell shocked and suddenly glassy-eyed Cowboys. With momentum filling their sails, the Steelers are driving for the winning score late in the 4th quarter when O�Donnell misfires again. Larry Brown records his 2nd interception of an O'Donnell pass seemingly to him an no one else, returning it 33 yards to the Pittsburgh 6-yard line. Emmitt Smith scores on a 2-yard TD plunge 2 plays later to seal the Cowboy win. Includes some pre-game and post-game footage.